We continue to keep our safety-shielded eyes on news related to respiratory protection, especially in regard to the new OSHA silica standards, which were codified in 2017. But a recent article by Ken Henry in Occupational Health & Safety, which put more light on the silica rules, reminded us of newly acknowledged dangers for welders. Last year, a leading global expert on cancers declared welding fumes as a Class 1 Carcinogen. This warning was added to the already acknowledged risk of cancer from the UV radiation found in welding work. The International Agency for Research on Cancer (IARC) announced their findings last April, which as Henry says, are “based on ‘substantial new evidence’ from observational and experimental studies.” The most startling part of the announcement, we think, is the point that as much as one percent of the global workforce may be exposed to welding fumes at their workplaces. Of course, one percent of the world’s workers are not welders. That means that workers in the vicinity of welding activities, with no involvement in that work task, may well be in danger. Compounding the problem, the most common respiratory masks have been found to be unacceptable for protection against welding fumes. Disposable masks do not provide the kind of particulate filtering necessary for welding. They may restrict breathing, and may not fit under welding face shields. Instead, welders should be using Powered Air Purifying Respirators (PAPR). Findlay partner Dräger offers the X-Plore 8000 model, which is a compact active purifier that can be worn on a belt and attached to proper face protection. 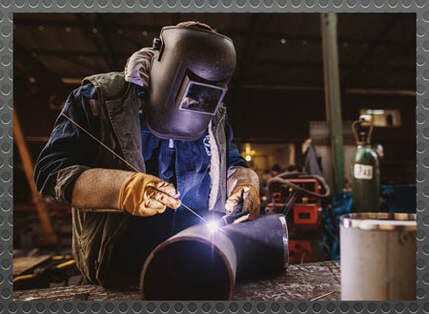 Of course, the welding area is subject to regulations (specifically, OSHA 1926.353 Safety and Health Regulations for Construction Welding, Cutting, and Heating) that mandate the presence of multiple types of ventilation and the replacement of contaminated atmosphere with respirable air. These steps are taken to protect not only the welder, and any assistants, but the entire workspace and all in the facility. Iron oxide and manganese are the most common hazards in welding fumes, so gas monitors that detect these pollutants are the obvious choice. Other substances found in welding fumes include chromium, nickel, molybdenum, vanadium, titanium, cobalt, and copper. Detection of any of these airborne metallic byproducts of welding at levels beyond the recommendation of OSHA (or your own policies that may exceed the legal demands) warrants the creation of a wider hot zone, and that the person wearing the monitor move farther away from the welder. Specific strategies for protection of the entire workforce are part of what Findlay calls Custom Corporate Training – a tailor-made, company-wide, centralized approach to safety and security management. Findlay All Hazards builds such programs for some of the largest brands in North America, and we can do the same for you. Contact us to find out more.